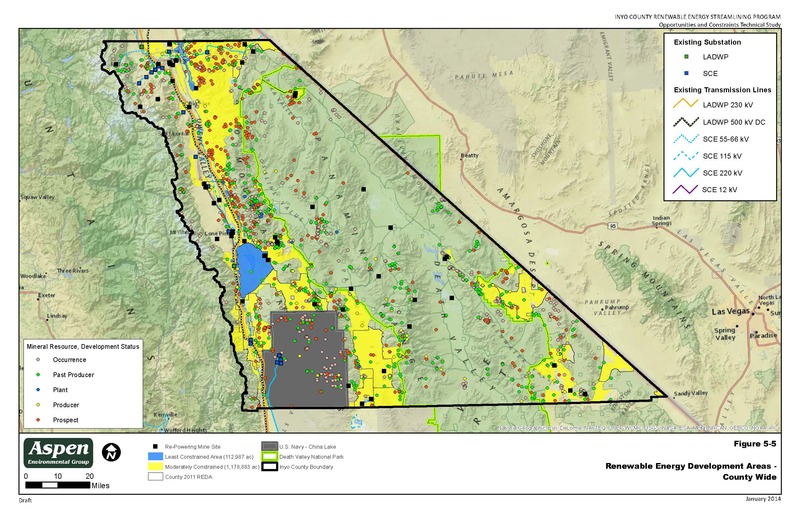 Inyo County has used its RECPG Program funds to develop a Renewable Energy General Plan Amendment (REGPA) to include policies for facilitating and locating renewable energy development in the County. To support the REGPA, in February 2014 Aspen, as a subcontractor to Helix Environmental Planning, Inc., has prepared an Opportunities and Constraints Technical Study (OCTS) that outlines key resource and infrastructure requirements and key environmental considerations for renewable energy development within the County. Aspen identified areas within the County likely suitable for renewable energy development based on renewable resource potential, low environmental sensitivity, and ease of connection to the power grid. Through the OCTS Aspen worked collaboratively with the County to identify areas suitable for siting of renewable energy (RE) in the County, and further refined those areas to Solar Energy Development Areas (SEDAs). Aspen analyzed the existing transmission infrastructure that would be most viable for exporting renewable energy including potentially necessary upgrades. Currently, Aspen is helping the County in developing its renewable energy policy updates for its General Plan Amendment and conducting portions of the REGPA EIR analysis. Aspen also provided technical input to the project description, drafted the alternatives analysis, and provided the list of cumulative renewable energy projects in the County and neighboring counties based on extensive work throughout the region. Aspen has prepared a socioeconomics write-up (authored by Negar Vahidi and Scott Debauche) for the REGPA EIR, which provides information on the County’s population, transient housing, local economy, public finance, and federal, State, and local economic regulatory factors and policy incentives. Aspen conducted both a socioeconomic and economic analysis of renewable energy development effects on Inyo County’s population, public services, and economy, including the potential for social disruptions. To help offset any potential negative effects of renewable energy development, Aspen provided recommendations on supplemental and new policy directives, which the County has incorporated into its draft REGPA. Aspen also prepared the cultural section for the REGPA EIR (authored by Beth Bagwell and Evan Elliott), including a comprehensive analysis of the existing Inyo County cultural setting and potentially sensitive areas using a predictive model. Aspen presented recommendations intended to reduce any impacts of large-scale solar development on cultural resources. On March 24, 2015 the Inyo County Board of Supervisors approved the REGPA.